Posted: Mon Feb 20, 2017 7:34 pm Post subject: Where to find origina inscription? "To speak the name of the dead is to make them live again, and restores the breath of life to him who has vanished." Does any body know where I can find original hieroglyphic inscription? In the same year that the three volumes by Carter and Mace were republished (New York, Cooper Square Publishers, Inc.) the present book appeared. It resulted from a cooperation well known already from AEB 60529. In her first chapter the author tells about the discoverers. Then she describes Thebes and its west bank (chapter 2), and the tomb together with its discovery (ch. 3). The historical setting of Tutankhamon's reign is the subject of chapters 4-6. Ch. 7 deals with his death and burial, 8 with funerary symbolism. The final chapter (9) discusses what happened after the king died. Following a "list of principal characters" (p. 290-293) A. Shoukry presents notes on the colour plates (p. 294-305). These masterpieces of photography were made after removal of the objects from their museum cases. The book translated by Claude ends with a bibliography (p. 306-307), a list of monochrome illustrations (308-309) and an index (310-312). Preface by Sarwat Okasha (9). One of the few Tutankhamun/KV 62 biographies/descriptions that I do not have, as I do not like the writing style and the nationalist attitudes of this lady. 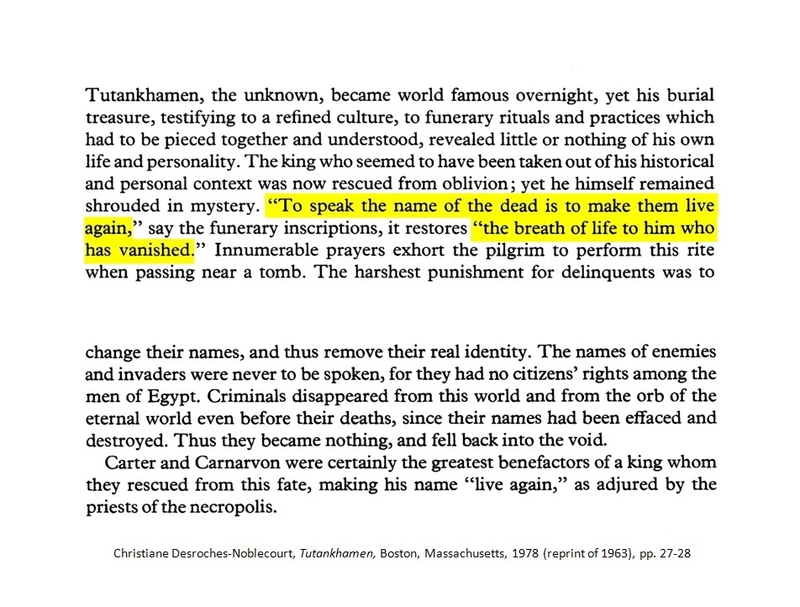 The sentence "To speak the name of the dead is to make them live again, and restores the breath of life to him who has vanished" is often cited in the Internet, but no references are given for it. It is called an Egyptian proverb, an expression of Egyptian belief or a citation from the Book of the Dead (however, no spell no. is given). Lutz has found the source of this quotation (or nearly), namely: Christiane Desroches-Noblecourt, Tutankhamen, 1963 [I have the paperback edition of 1978]. She writes on pp. 27-28 that Carter and Carnaveron rescued Tutankhamun from the fate of being forgotten making his name "live again". She mentions "funerary inscriptions" as a source for the statement, but they are not from Tutankhamun's tomb. Though the wish of the dead that his name may be pronounced can be found on many inscriptions throughout the ages ("appeal to the living" or the Htp-dj-nsw-formula) the exact wording of this statement seems to be of the Late Period. One example can be found on a statue ÄM 17700 of the Neues Museum (Berlin), which is dated to the time of Psametik I (26th dyn.). 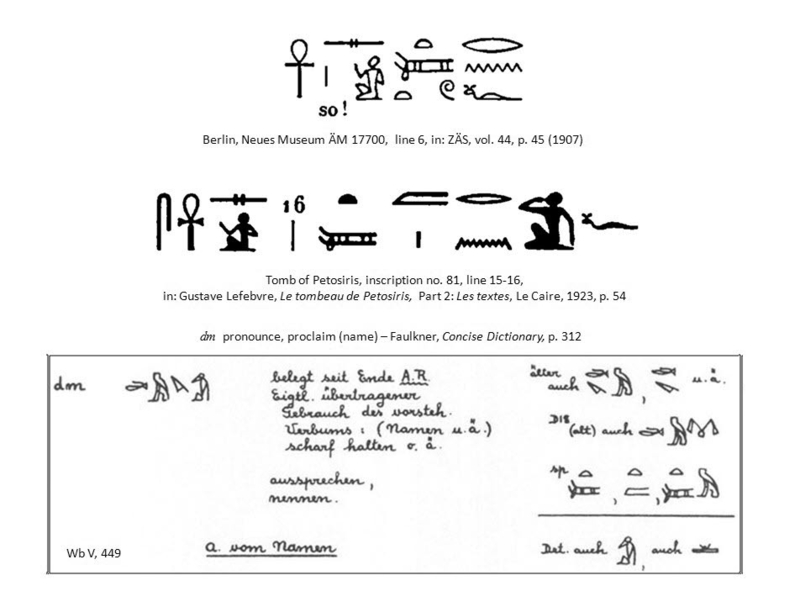 Another example is in the tomb of Petosiris (early Ptolemaic Period): inscription 81 and 65, the latter is rather similar to the Berlin inscription. As there is still another statement of this kind, it is indeed seen as a proverb. The Petosiris statement: sanx s dm(.w) rn=f "A man will live (when) his name is pronounced." sounds rather similar to Desroches-Noblecourt's obviously free translation: "To speak the name of the dead is to make them live again." (The writing of dm with U15 tm in the Late Period is mentioned in the Wörterbuch, vol. V, p. 449.) - I did not make a search for the second part of the sentence. Thank you Lutz for your effort, and your friend for answer! For somehow, it reminds me on the that famous inscription "The death will come on the swift wings to those who disturb sleep of the pharaoh." As I remember, this is also the fake? Am I right? P.S. Is there any possibility to find hieroglyphic insciption of the second part of fake sentence (and restores the breath of life to him who has vanished.)? A man whose name is pronounced, will live.